Nominated by Szczepan Marczyński, Poland, seconded by Jonathan Gooch, Great Britain. Mrs. Aili Kivistik has been breeding Clematis since 1974. Together with her husband, Uno Kivistik, they bred, named and introduced to the market over 140 Clematis cultivars in 1979 - 1998. Apart from that, they also bred other plants, such as apple trees and roses. After Uno Kivistik's death, Aili continues her Clematis breeding work with her son Taavi and his wife Aime. Together they have bred named and introduced numerous cultivars that are highly valued and cultivated worldwide. 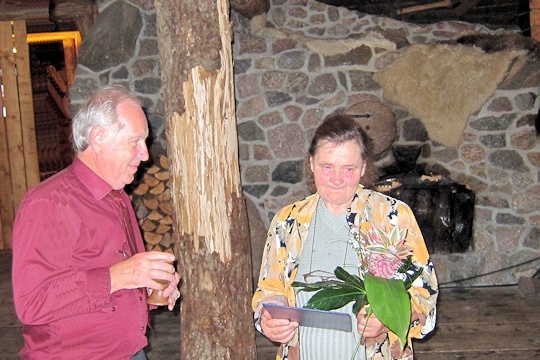 Uno and Aili Kivistik contributed greatly to the popularization of Clematis in Estonia, other post-Soviet Union countries and in Scandinavia's countries, particularly in Finland. Aili and Uno Kivistik, as well as the rest of her family have been members of the International Clematis Society since the beginning of the 90's. In 1992, 1998 and 2005 they organized 3 very interesting and unforgettable study trips and conference in Estonia. Nominated by Külvi Kaus, Estonia, seconded by Fiona Woolfenden, Great Britain. Estonian Clematis Society greets you for the approaching meeting in Belgium in June 2011. Regrettably we are not able to attend the meeting this year. However, we would like to warmly thank you for your support and cooperation, for sending us newsletters and Clematis Yearbooks. Estonian Clematis Society meets every 6 months and based on last meeting we would like to propose Eerika Mahhov as a candidate for International Clematis Award. We would highly appreciate if any Member from International Clematis Society could support our proposal and sincere wish. Eerika has been one of the most active members in the clematis society. 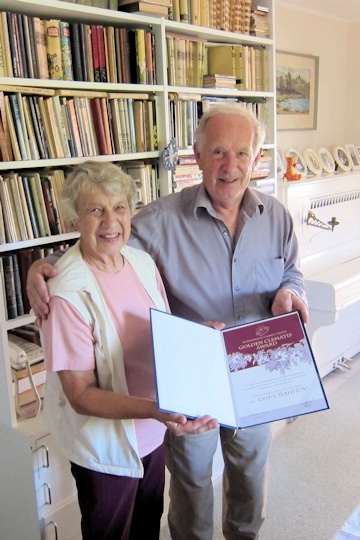 By turning 80 on November 22nd 2011 she has dedicated over 30 years of her life to Clematis with her husband Aleksei. Her advocacy of Clematis in Estonia has been immeasurable. Every year she has published many articles on how to grow Clematis and which sort of plants grow well in our Nordic climate. In 2010 her fantastic book "Clematis to every garden" was published. In our Society meetings she's the most desired lecturer. Eerika has dedicatedly been for many years an active correspondent member in International Clematis Society. At her home numerous domestic and international guests/friends have been able to experience and wonder at the growth and beauty of Clematis. With Aleksei they grow and commercialize thousands of plants every year, which beautify gardens and neighbourhoods not only in Estonia. This is just a short reflection from long list of dedication, contribution and love for Clematis she has shared with us. Therefore we fully support her nomination and ask for support from your side as well. 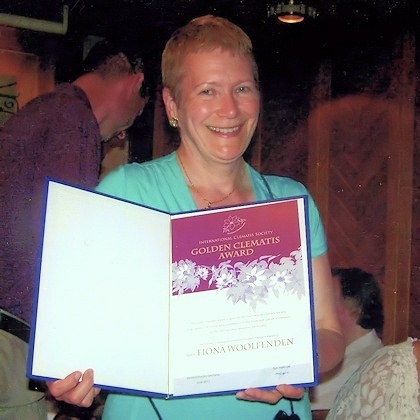 Fiona Woolfenden has been the Honorary Secretary of the International Clematis Society for over 15 years. During this time, she has practically run our society, organized or coordinated almost all our activities and actively supported consecutive I.Cl.S. presidents. She has prepared and kept the minutes of board meetings and general assemblies, and prepared newsletters (2-3 issues every year) containing current information about the life of our Society. She has helped organize trips and conferences, given lectures and drawn up reports documenting them. She has also written articles and reports for Clematis International on our activities and taken part in preparing for print our Journals. Fiona has dealt with all issues concerning membership and cooperation with other societies. It would take too long to mention all the work she has done and still does for promoting and developing our society. And every single activity involved preparing very copious and time-consuming correspondence. Fiona Woolfenden has put all her heart into this work and she has devoted a tremendous amount of her time, energy and creativity. She is very tactful and kind and ready to help, whenever need arises. That is why I put forward a motion to nominate Fiona Woolfenden for International Clematis Society Golden Clematis Award. 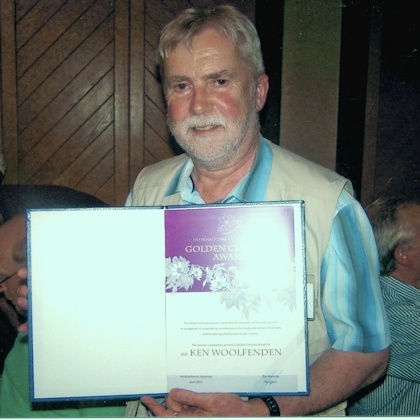 Ken Woolfenden has been the Honorary Editor of the International Clematis Society since 2001. While editing our "Clematis International" journal he has brought it into full bloom, significantly increased its volume, enriched it with illustrations and always tried to include interesting topics and authors. Ken Woolfenden is also the creator of the I.Cl.S. website and currently runs it, covering current events, adding information and writing interesting and illustrated informal reports on trips and conferences of our Society. He takes a lot of pictures that are used to illustrate numerous articles not only in our journal and on our website but also in the British Clematis Society and on the 'Clematis on the Web' website. Ken also actively helps Fiona Woolfenden in her work as secretary, dealing with a significant part of the correspondence and issues concerning membership, and participating in organizing board meetings and general assemblies, preparing newsletters, etc. Ken Woolfenden also takes active part in organizing our trips and conferences and was the main organizer of two conferences held in Great Britain. He puts enormous amount of time, energy and creativity into I.Cl.S. activities. He is very calm, devoted and kind and always ready to offer his help. That is why I put forward a motion to nominate Ken Woolfenden for International Clematis Society Golden Clematis Award.